Three new faces will be competing for the 2012 Beerdrinker of the Year National Finals on Saturday the 25th. This year’s lucky but deserving trio is Warren Monteiro from New York City, Greg Nowatzki from Las Vegas and J. Wilson from Prescott, Iowa. If you are in the Denver area, or have the means to travel, don’t miss this event – it is the most prestigious title in the country for beer aficionados. Being involved in the selection process, and having reviewed numerous resumes, I can guarantee you that these three are on a different level when it comes to beer knowledge and appreciation. Warren, Greg and J. Wilson will be flown in for the long weekend and pampered at the Brown Palace at the Wynkoop's expense. The competition is open to the public and will be held in the Wynkoop Mercantile Room on Saturday, February 25th starting at 2 pm MT. Get there early to nab a seat and have time to enjoy happy-hour priced beers, including a whiskey-barrel-aged Russian Imperial Stout brewed to honor last year’s champion Phil Farrell. Here is a bit of background on each of the finalists. Warren Monteiro, a New York City beer traveler, homebrewer and BeerSensei contributor for Alestreet News. Monteiro has sampled beers in Europe, Central American, India, Sri Lanka, numerous other nations and throughout the United States. In 2011 he visited breweries and beer festivals in England, Belgium, the Netherlands and the US. He samples an average of 350 beers each year. His philosophy of beer drinking: “It’s not a habit, it’s a lifestyle. This is why I constantly travel – to get a taste of a new brew or one I’ve been missing, and to find a way to share it whenever possible. I consider creative beer drinking to be an essential part of the tapestry of art and fellowship contributing to a full life. The beauty of beer hunting now as opposed to the early ‘80’s is that I’ll never catch up! His home beer bar: Blind Tiger Ale House, New York City. 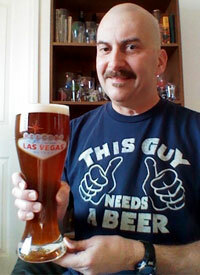 Greg Nowatzki, a Las Vegas, Nevada accountant, home brewer and beer judge. Nowatzki has tasted over 13,600 beers from 84 different countries and all 50 states in the US. He has visited over 500 breweries in 32 different states and the District of Columbia, and attended over 150 beer festivals in 8 states. In 2011 he visited 16 beer festivals (including an 11th consecutive Great American Beer Festival) and visited over 100 different breweries in 7 states. 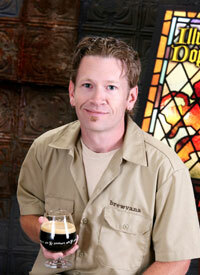 J. Wilson, a Prescott, Iowa writer, homebrewer, beer judge and beer blogger. He has a 3-tap, 8-foot home bar supplied by a 10-gallon brewing system in his basement. An advocate for beer for 15 years, he organized numerous beer events in his hometown in 2011. The past year was highlighted by a research project in which he fasted for 46 days on water and a dopplebock he brewed with a local brewery. It became a book, Diary of a Part-Time Monk. His philosophy about beer: Living life in search of brewvana (an ideal condition of harmony, beer and joy), I seek to educate and advocate on behalf of craft beer, folding good beer into a good life.